Hyssop, used in our Aloe Herb Facial Cleanser, comes from an herb called Hyssopus officinalis, which is native to the Middle East and southern Europe. The leaves, stems, and flowers are known for their cleansing properties—perfect for a natural cleanser! The Hyssop plant is a perennial that belongs to the same family as mint. As you can see from the picture, it has a slender stem with leaves stacked on both sides, and can grow to a height of up to two feet. Flowers usually appear in the summer, from June to October, and are mostly purple-colored, though some are white or pink. The leaves and stems of hyssop contain many beneficial compounds, including flavonoids, tannins, caffeic acids and glycosides. Traditionally, the plant was used to relieve respiratory ailments. Aromatherapists still use hyssop today in vapor therapy to calm coughing. It is also known as a key ingredient in massage oil blends to help ease the mind. Cleansing: Hyssop provides natural cleansing properties that can help minimize the appearance of pores — making skin look softer and smoother. Great for Oily Skin: Hyssop can also help liven up your complexion as well as balance oil and help cleanse pores. Great for Sensitive Skin: Because of its natural properties, hyssop oil has a reputation for helping those with sensitive skin. 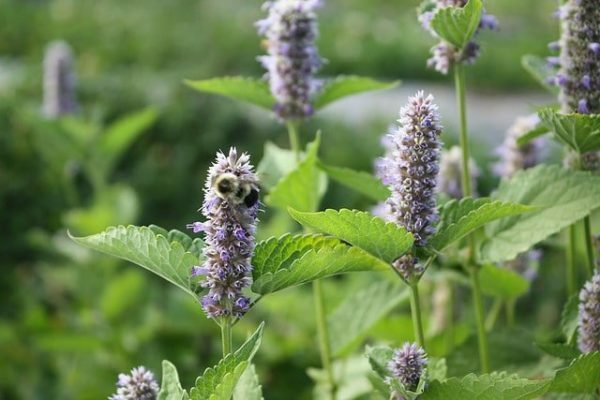 One other neat tidbit about hyssop is that historically, it was used to clear out unwanted energies from temples and sacred places, and was considered a sacred herb because of its cleansing properties. Not only will you enjoy clean, fresh skin, but don't be surprised if you find that a morning cleanse with Aloe Herb Facial Cleanser leaves you feeling alert, awake, and ready to take on the day! Have you tried hyssop, or Annmarie Gianni's Aloe Herb Facial Cleanser? Please share your story, or any tips for our readers. Photo courtesy interchangeableparts via Flickr.com.